A long ago, the Hare and the Quail were good friends. One beautiful day, the Hare told his friend that he had an idea of a game they could play that day. “My friend, let’s go to the bush, I have a very good game, if you like we can play together.” Said the Hare. The Quail agreed to be taken there and play together. When they reached the forest, the Hare jumped inside a big hole and instructed the Quail to set fire at a corner of the hole. The Quail did as instructed. Soon the Hare started singing while inside the hole: “I’m eating a lot of maize grains, honey and many things!” When the Quail heard what the Hare was saying, he pleaded with the Hare also to let him inside the hole to share the maize grains and the honey. The Hare told him to wait a little. When the fire went off, he came out of the hole and told the Quail that by now his stomach was full. 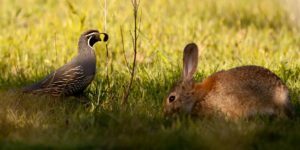 The Quail said that he was very hungry, so the Hare told him: “Jump there inside the hole. Thereafter I will surround you with fire and you will eat everything which you want inside.” The Quail, with great confidence, was jumping inside. The Hare lit fire; when the fire came close to the Quail, he was crying: “I can’t see anything except a lot of fire!” But the Hare said: “Just wait a little soon you will see the maize grains and honey .” As the fire came very close to the Quail, he tried to get out of the hole, but it was not possible. The Quail got burned and died. Now the Hare ate his friend’s meat. The hare is most of the times mean in fairytales. But is one of my favourite charactors.